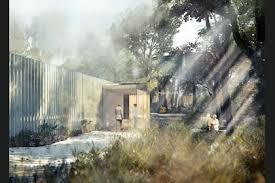 Construction starts on the world’s first permanent building created using hardwood cross-laminated timber (CLT). 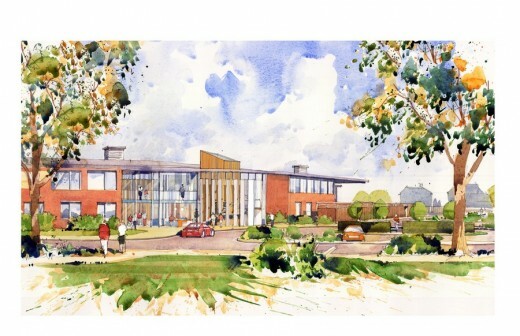 The centre will be located adjacent to the Southampton General Hospital oncology unit. It is due to open in 2017. A new 8541 sqm local NHS Hospital building. As part of a wider reconfiguration of hospital services in East and North Hertfordshire the new QEII is one of the first of a new generation of hospitals commissioned to provide key healthcare community services. It replaces the existing district general hospital built in the 1950’s, which was one of the first purpose built NHS hospitals in the UK. Planning permission granted by Southend Borough Council for a new hospice and landscaped gardens on the old Ekco Radio site. 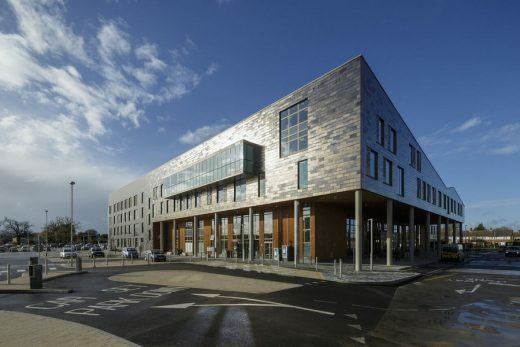 IBI Nightingale has unveiled The Montefiore Hospital, a new private hospital in Brighton and Hove, East Sussex. The £35 million investment has given a former Victorian storehouse its third lease of life, with an elegant extension and refurbishment that provides cutting edge medical facilities. Designed by Clayton & Black in 1899, No.2 Montefiore Road was a furniture depository built for Hanningtons, a local department store. CircleBath is Foster + Partners’ first hospital and the first in a programme of new independent hospitals which offer a radical departure from orthodox approaches to hospital planning. The compact design encourages a sense of community and well-being with facilities more comparable to a luxury hotel rather than a traditional hospital. Maggie’s Nottingham serves the Mid Trent Cancer Network and is situated next to the Breast Institute at Nottingham City Hospital. The Mid Trent Cancer Network covers the populations of Nottingham, North Nottinghamshire and Lincolnshire – approximately 1.3 million people. Within this area, there are over 4,000 new cases of cancer a year. The near symmetrical design and generous height of Maggie’s Nottingham allows the building to have a sense of space and balance. The oval building of green glazed ceramic tiles floats over a smaller basement, with plants and trees surrounding. This project has been designed from the inside out; the ingenious manipulation of scale has successfully created an intimate and domestic environment within what is actually a very social space. The building is crafted with refinement and sensuously detailed; colour, material and light have been used to great effect, creating an environment that is robust and tactile, jewel-like and rich. The use of mirrors and visual illusions is both appropriate and refreshing. How can a building can generate an immediate sense of welcome, serenity and even love on a frantic Hammersmith thoroughfare and in the shadow of a dauntingly huge NHS hospital? 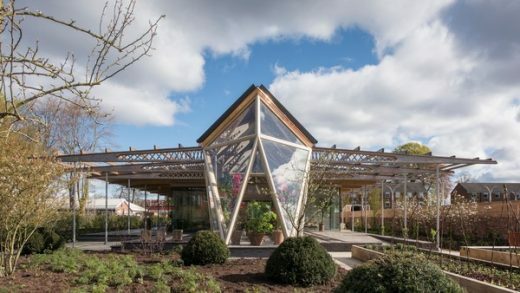 RSH’s quietly confident Maggie’s Centre building is unquestionably a haven for those who have been diagnosed with cancer. 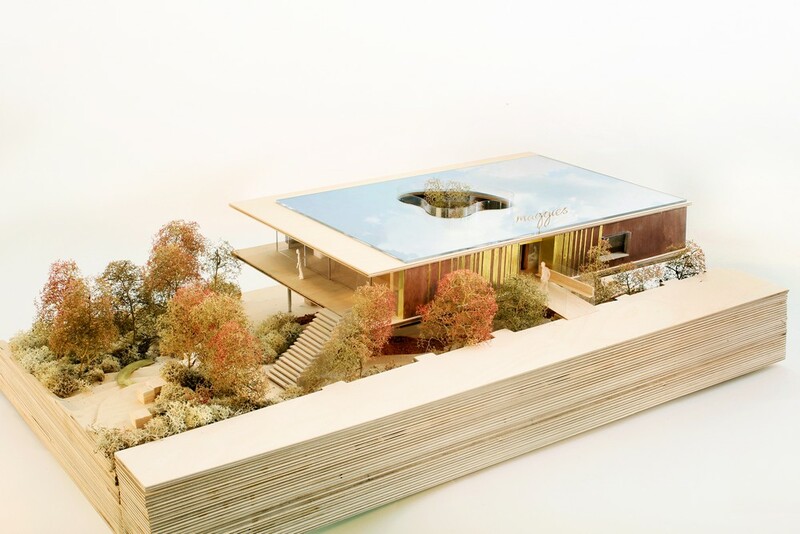 Their achievement is in having created a completely informal, home-like sanctuary to help patients with cancer. Conceived as a two-storey pavilion, the architects have sheltered the centre from its harsh surroundings with a thick and cheerful orange masonry wall that also serves as a backdrop for carefully planted tree groves and gardens.